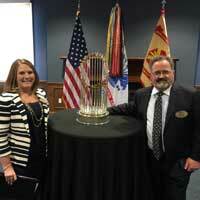 Ervin and Coleman with the 2015 World Series trophy at Fort Leavenworth. On Dec. 2-3, Midwest regional director Katie Ervin and associate vice president for Military and Governmental Affairs and regional director of National Capital Region Sean Coleman attended the Army University Symposium at Fort Leavenworth, Kansas. institutions attended the five symposium's panels. As a special surprise, Ervin and Coleman were able to get their picture with the 2015 World Series trophy. Baseball's reigning champs, the Kansas City Royals, were visiting Fort Leavenworth to honor military members.